NORTHEAST HOUSTON — Business leaders and residents of the area bordering the Eastex Freeway were pleased by the announcement this week that a major developer had acquired 38 acres of land at the corner of East Little York and US59, with plans to build a large new shopping center. Clay Trozzo, a spokesman for Property Commerce Company, said they had acquired four separate tracts at this corner, totalling 38 acres. One major piece was owned by Solid Rock Baptist Church, who planned to build there. That site was originally a Ford dealership. The new development has been named Northeast Marketplace, according to Trozzo. It will total 275,000 square feet of retail space. The first tenant that has been identified is Home Depot, who purchased 11 acres of the project, for a new 135,000 square foot store. Demolition is already underway, as evidenced in the photos above, and an opening of Spring 2005 has been set for the first store. Property management also plans to lease space to two more mid-size stores, approximately 30,000 sq. ft. each, but these have not yet been identified. According to the plans, this would leave about 75,000 sq. ft. for smaller, neighborhood type stores. Architect Charles Thompson is reported to be working on the plans for the new center. Property Commerce is a Houston developer, who is also working on a new project at US290 and Spring Cypress Rd. Trozzo pointed out that the Eastex corridor is now underserved, a point that the Aldine Improvement District has been working on for over two years. They anticipate that sales taxes from this project will be used to fund other area improvements. Trozzo said that within 5 miles of the site, over 250,000 people live, work and shop, and the potential for commerce is very strong. In addition, many more people pass the site on US59 every day on the commute to downtown Houston. Aldine Improvement District held their regular public meeting last Tuesday, August 17th, and introduced three new members of the board of directors to the public. These are John Broussard, William Townsend, Jr., and Gerald Overturff. JOHN BROUSSARD, to fill the position 2 formerly held by Sylvia Bolling. Mr. Broussard has lived in the Aldine area for 30 years, and owns Broussard Air Conditioning and Heating. He belongs to ACCA, Knights of Peter Cleaver, and Acres Home Chamber of Commerce. WILLIAM (JIM) TOWNSEND, JR., to fill the vacancy formerly held by Leland Jauer, for position 4. Mr. Townsend is Chief Financial Office of North Houston Bank, at Little York and US59. He is a CPS, and a career banker. He has served on the Tomball Chamber of Commerce and as an advisory director of the Tomball Economic Development Board. County Pct. 4 Road and Bridge department. He was part of the team that created Sunbelt Fresh Water Supply District, and served 4 years as its president. He is a member of Humble Masonic Lodge 979, and the Arabian Shriners of Houston. Due to enabling legislation, Mr. Broussard will be recommended to the County Commissioners for confirmation, and the others will take office by action of the AID board. TAKS, FCAT, HSPA? These probably look like just a jumble of letters to most of us, but to high school students in 24 states, these letters mean the difference between a diploma and a ticket back to high school. They are the abbreviations for high school exit exams. Students come to dread the exit exams required for graduation. But it’s worth it once they get that passing score. They’re ready for college or a good job, right? Unfortunately, no. Too many students who pass exit exams are still not ready for college or for a well-paying job. A study by Achieve, Inc., a nonprofit organization formed by governors and business leaders to promote high academic standards, shows that most high school exit exams don’t measure the skills students need for success in college or the world of work. The report, Do Graduation Tests Measure Up? : A Closer Look at State High School Exit Exams (available free at www.achieve.org), analyzed tests in the six largest states requiring them. It found that students who pass the tests in those states aren’t necessarily college-ready. In fact, the “exit exams,” more closely resemble ACT’s EXPLORE Assessment designed for 8th and 9th grade students. * 4 years of English — grammar, composition, literature, etc. * 3 or more years of social studies — history, economics, geography, civics, psychology, etc. * Additional courses in visual arts, music, theater, dance, computer science, etc. Students who followed ACT’s guidelines scored two and a half points higher on the ACT Assessment in 2003 than students who did not. But less than half of the students who took the test took the recommended courses in math and science. In other words, many students who intend to go to college are making the choice to avoid courses that will prepare them for college. get credit for them. They don’t count toward graduation requirements. It’s a waste of both money and time, learning skills that should have been mastered in high school. Even students who enroll in community colleges, thinking they might not be held to as high an academic standard, receive a rude awakening when they are placed in remedial classes. In too many cases, this means a lot longer than two years to earn a “two-year” degree, and more than four years to earn a “four-year” degree. An exit exam can be a good tool to see what students have learned, but it should be viewed as a minimum level of learning. Students need to go further to truly prepare themselves for college and for the future. If you’re a parent of a high school student, it’s a good idea to consult with your student’s counselor and make sure his courses are the ones needed for college success. The hard part is convincing some students that hard work in high school will pay off down the road. College requires a lot of difficult preparation, and students must have the foundation on which to build their knowledge before they arrive on campus. Rose Rennekamp is the vice president of communications for ACT. She is a mom and has a master’s of education in guidance and counseling. Have a question you want answered in a future column? Send a letter to this newspaper or e-mail Rose at AskRose@act.org. MacArthur Senior High School junior Alexander Johnson has been named one of three finalists for the 3rd annual George H.W. Bush/Kiwanis Sports Hero Award. The winner will be announced on Tuesday, Aug. 24, during a dinner at the Intercontinental Hotel. The award honors a Houston-area football player who is a standout on the field and in the community. Johnson is a two-year letterman for Jerry Drones’ Generals. When the 2004 season begins, Johnson will be a starting linebacker for the second straight year and will also see duty at tailback. The well-spoken Johnson is also a star in his community and in the classroom. He volunteers in the nursery at Wheeler Avenue Baptist Church and is involved in various youth organizations at the church. Academically, Johnson carries a 6.8029 grade point average taking AP (advanced placement) and GT (gifted and talented) classes. The likeable junior added he learned at an early age the importance of sharing his time and talents with others in the community. 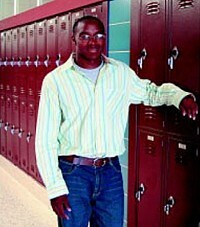 After high school, Johnson would like to attend the University of Southern California and study pre-law. He is the son of Maurice and Deborah Johnson. Just think, another month and it is fall of the year. Time flies when you are having fun or so they say. I ain’t been having fun as I’ve been playing plumber and working on the sink faucet trying to stop a leak. At least it was from the spigot and into the sink so no major clean up mess. Thought I might have to replace the entire faucet fixture and that would be a night mare trying to disconnect the lines and reconnect them. Seems to be too much of me getting under the sink, and I’ll swear the opening has shrunk over the years. Fortunately the leak was stopped by installing new rubber seals. Had lunch with the old policemen this past week and one brought up conversation about a fellow coming back from Iraq in a week or so. He told of the price of gasoline was two cents a gallon and diesel was three cents a gallon over there. This same fellow who is coming back to the states and will be hunting with us soon; it should prove real interesting to listen to what he has to say about working over there and all. An old friend from back home spoke of a labor of love tending to his recently incapacitated wife. I had to look up labor of love and found mostly “having a baby” articles. Using the definition: it said something like doing what you are doing for self satisfaction with no compensation or reward. It could have read: “Like your growing tomatoes this year Charlie” because my crop was not worth a hoot. It goes farther than that and deep down in the heart. The Mrs. asks me how difficult I thought it would be taking care of an incapacitated person, doing all of their chores in between coupled with my own. Gave her a look and shook my head negatively in response. We be blessed so let’s move on. 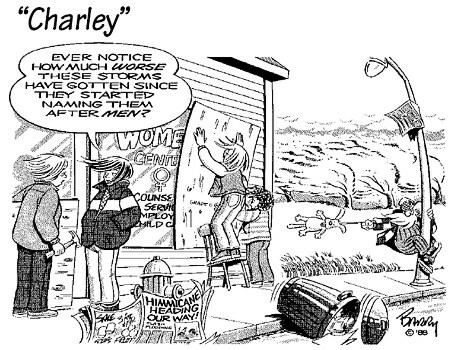 Hurricane Charley went through the Southeast with a huff and a puff. Old brother in law in SC lives on the backwaters of a large lake there. He said they drawed the lake down in anticipation of the on coming hurricane (10 inches). I thought that was a grand idea of whoever is in charge of the dam on that water. Too bad the engineers on Texas reservoirs don’t do that in preparation of heavy rainfalls upstream, etc. There has been enough flooding over the years that might have been eliminated if the water in our dams was lowered in time. What do you think? Of course they don’t do flood control or so I read a long time ago. Times change and so should those people’s thinking. Old friend said happy hour is a nap. Things have been a bit quiet around the Northline Mall management offices the last few weeks since marketing coordinator Michael Corcoran shipped out to serve in Kuwait. In addition to his career at Northline Mall, Corcoran is a heavy crane operator in the Navy Reserves. He has served in the military over ten years and will soon be promoted to E7 Chief Engineer. Corcoran and his unit are in Kuwait for what could be a six month to one year deployment to off load and in load supply ship for the war effort in Iraq. “We are a family here. We are all beginning to miss him,” said coworker Lee Garza. Corcoran’s absence left a mark on the staff at Northline which has grown used to Corcoran’s mischievous humor and practical jokes. One of Corcoran’s favorite toys around the office was a dart gun. “I’d sit at the computer and the next thing I know, there’d be a dart on the computer screen,” Lee said. The staff said Corcoran usually got out of trouble by flashing a smile. When he is not serving in Kuwait, Corcoran lives in the Woodlands with his wife Brenda. He often works to improve his truck and remote control boat. Corcoran also competes at slalom skiing. “He may try to talk the admiral into towing him behind the boat,” said mall director Rebecca Victor. The Northline Mall office sent Corcoran away on a positive note with a farewell party at his favorite Mexican restaurant. The office staff can’t wait to hear how Corcoran is doing in Kuwait. They are especially curious about how he is dealing with the heat. The office thermostat was often fought over by the coworkers. “He likes it cold,” they said. While the office crew misses Corcoran’s antics around the office and the work he does promoting the mall, they know he is fulfilling an important role in the country’s military defenses. They just look forward to a barbecue with some cold beers to welcome him back home. NORTHEAST HOUSTON  As students and teachers were preparing to head back to school this week, the new staff got a big welcome from the North Houston Greenspoint Chamber, to set the mood for a good school year. Present for the ceremony were the MacArthur HS Army color guard, and the Nimitz HS choir. On Wednesday morning, about 50 new teachers of North Forest ISD were welcomed by the Chamber in a breakfast event at the Hotel Sofitel. Present at the ceremony were the new Superintendent of the district, Dr. James Simpson, and the board members and new staff. 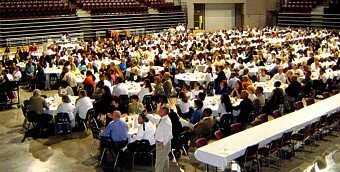 Speaking to this group was Dr. Bennie Lambert, motivational speaker from North Harris College.